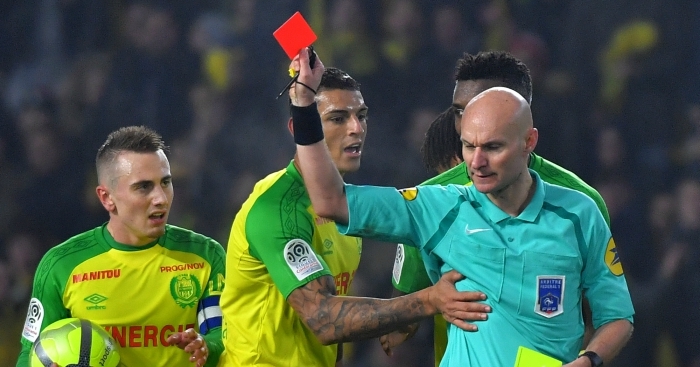 Referee Tony Chapron has been stood down from this week’s Ligue 1 match between Angers and Troyes and will face a disciplinary hearing over the controversial end to Sunday’s game between Nantes and Paris St Germain. The match, won 1-0 by PSG, ended in bizarre circumstances when Chapron, having been knocked to the ground in an accidental collision with Diego Carlos, appeared to kick out at the Nantes defender before showing him a second yellow card. Nantes president Waldemar Kita called for Chapron to be banned for six months and several players also demanded sanctions, and the French Football Federation announced on Monday that it would take action. “The withdrawal from duty of Mr Tony Chapron, initially appointed to referee the Angers SCO-ESTAC Troyes match in matchday 21 of Ligue 1 on Wednesday January 17, until further notice. “Mr Tony Chapron will shortly be called to meet the LFP (French football league) disciplinary committee. Nates president Kita told L’Equipe: “I received 20 SMS from all over the world telling me that this referee is a joke. “What do you want me to say to you? If I talk too much, I will be summoned by an ethics commission. We have no right to say anything. “It’s still scandalous to see that. We give a red card to a player who did nothing. Where are we? He has to go back to school. “Chapron has to rest and get a massage, it works like that now, we cannot see him. I’m waiting for the green light, otherwise I’ll be killed. It’s amateurism. “Sincerely, I think he did not do it on purpose. I do not want to believe he did it on purpose. “At least, you apologise but you do not give a red card, it’s not serious. “We still have to find a solution, because there is a problem in all this. “It makes me laugh at the end. I have never seen that before.